The easiest is to react. The second easiest is to respond. But the hardest thing is to initiate. When you change the way you look at things, they will change how they look at you. First day lecture at Ravensbourne Paul Sternberg introduced a name I had heard before but never looked up: Tim Brown, CEO of IDEO and father of Design Thinking. Over the past months he has come back in my research, in articles I am reading, in the classes I attend and in projects I find interesting. Let me tell you why I embrace this way of thinking: I am a born Montessori child. Maria Montessori constructed an educational method where most learning is based on fundamental ways for humans to learn through practical play, learning from peers and with freedom to choose what you would like to discover. With my endless curiosity this method fitted like a glove. Helping and learning from the other kids was a blessing, this is how I have learned the most I believe. The way IDEO embraces that in their company sounds like my primary school system but the difference is that the helping is more structured. It surprises me that people have to be encouraged to help each other. 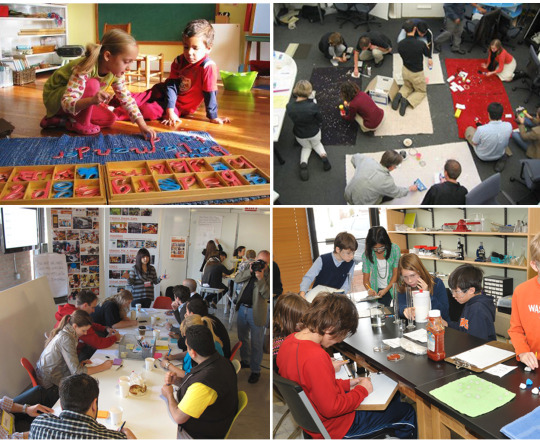 I have added some pictures that show the striking similarities between Montessori and IDEO. Tim Brown, you will hear from me! I will read some more about you, to start with your book! Thank you Paul Sternberg for pushing his name forward.